Has the wet weather interrupted planned nitrogen (N) fertilizer applications? What are the options if corn has emerged? All is not lost. In fact, in wet springs sidedress N can be an advantage because delayed application avoids potential losses and increases use by the crop. Sidedress inject anhydrous ammonia or urea-ammonium nitrate (UAN) solutions. Injection can be effective between every row or between every other row, and can be accomplished with cultivation equipment. Surface dribble UAN between corn rows, or between alternating rows. Broadcast dry granular urea, UAN solutions, granular ammonium nitrate or ammonium sulfate. 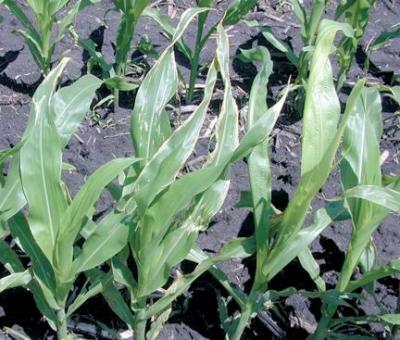 Broadcast UAN can cause corn leaf burn and plant stunting. Little prolonged damage will occur as long as plants are small. The growing point remains below ground for several weeks after emergence (until about the V5 growth stage), so it is not be directly affected by broadcast N application. Granular urea is not as damaging to corn plant tissue as UAN solution. You should expect some white-to-brown leaf margins or spotting on leaves from granules that adhere to wet leaf surfaces or fall into the whorl (symptoms appear later as leaves emerge from the whorl). This damage typically is cosmetic and should not extensively harm the plant or affect yield. Little material adheres to plants when they are dry or falls into the whorl when plants are small. Ammonium nitrate and ammonium sulfate can cause more tissue damage than urea, so rates should be limited more than with broadcast urea. 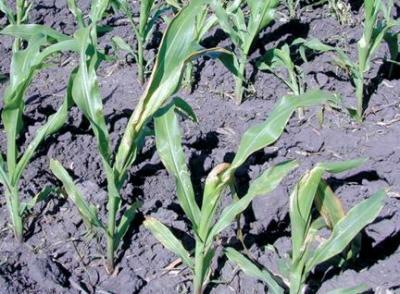 If large amounts lodge in the whorl, extensive tissue damage and plant stunting can occur. With a good broadcast distribution of product or with low rates of application, such damage should not be an issue (it could occur if material dribbles out of the applicator over a corn row). In most situations, N applications delayed until approximately the V6 growth stage should not result in yield loss. The more fertilizer N or manure applied preplant or at planting, the greater the amount of residual soil N, or the larger the rotation effect for supplying available N (those fields with lowest expected response to applied N and least additional N need), the later applications can be delayed into the season with little crop N stress or yield loss. These fields should suffer the least if N application is delayed. If the soil N supply is low (fields with the greatest potential response to applied N and largest N need), and especially if little to no N was applied preplant or at planting, applications should be made before approximately V6 if possible and these fields should be targeted for priority applications. Leaf injury from broadcast urea at 50 lb N/acre to V6 stage corn. Leaf injury from broadcast ammonium nitrate at 50 lb N/acre to V6-stage corn. This article originally appeared on page 72 of the IC-486 (9) -- May 14, 2001 issue.